Thank you everyone for entering the Hiya Luv Handmade giveaway! And thanks so much to Gina for allowing me to do this giveaway for all of you! Do you want to know who won?! 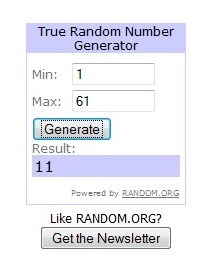 The winner of the $25 shop credit to Hiya Luv Handmade, chosen by Random.org is: Number 11! I'll let Gina know you won! If you didn't win and still would like to purchase something from Gina's shop, don't forget about the discount code: AGLIMPSE20 to get 20% off your purchase. FOR REALSIES!!!! WOW!!! thanks you guys!!! !